Microsoft PowerPoint Web App extends your Microsoft PowerPoint experience to the web browser, where you can work with presentations directly on the website where the presentation is stored. This article is only relevant for folks whose organization is using SharePoint 2010 or an older version. If you aren't in that category, click this link to read about the new, improved PowerPoint Online. You create a presentation in Microsoft PowerPoint. You want to post it on a website so that other people can view it, or even present it as a slide show. What if you notice after you've posted it that you left a slide out? Wouldn't it be great if you could just fix it quickly, right there on the website? PowerPoint Web App makes this scenario possible. In Microsoft PowerPoint 2010 you can start using PowerPoint Web App by saving your presentation to your SharePoint library. 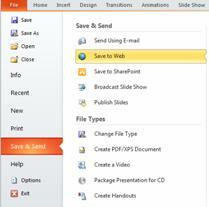 On the File tab, click Save & Send, and then click Save to Web or Save to SharePoint. Now, your presentation is available to view or present quickly, to edit in the browser, or re-open in PowerPoint. 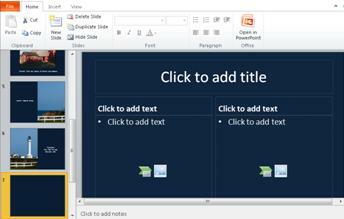 Note: Presentations don’t need to be created in PowerPoint 2010 to be opened in PowerPoint Web App. For best compatibility, use Office PowerPoint 2003 or later, or use PowerPoint for Mac 2008 version 12.2.9 or PowerPoint for Mac 2011. If you’re using PowerPoint 2003, install the most recent service pack and save presentations on your computer as .pptx files. Then upload the presentation to a SharePoint site where Office Web Apps programs are configured. When you open your presentation in SharePoint, PowerPoint Web App opens the presentation in the browser, where you can step through the slides, view notes, or switch to Slide Show to view the presentation full-screen. If you don't have Microsoft Silverlight 2 or later installed, PowerPoint Web App displays a bar with a link to install Silverlight. Silverlight is not required, but slides are better scaled to the size of the browser window and some animation effects are smoother if you have the latest version of Silverlight installed. If you receive an invitation to view a broadcasted slide show, click the link in the invitation to view the slide show. The presenter uses PowerPoint 2010 to step you through the slides. For more information about broadcasting slide shows on the Web, see About the Broadcast Slide Show feature. Presentations that include audio or video content must be opened in the PowerPoint desktop application to play the audio or video. In PowerPoint Web App click Open in PowerPoint. 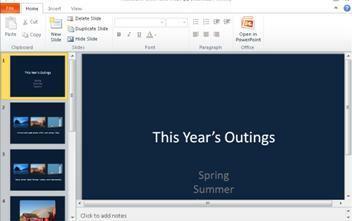 For more information about opening presentations directly into the PowerPoint desktop application, see Seamlessly edit in PowerPoint, later in this article. You can print the slides in PowerPoint Web App. On the File tab click Print. Note: A PDF viewer is required for printing in PowerPoint Web App. If you want to make changes in the presentation, click Edit in Browser. In Editing view, you can add and delete content, and format text. You can also add, delete, duplicate, and hide slides. You can add SmartArt, pictures, and hyperlinks. Go to the Insert tab to add these. If you want to add effects or make changes to SmartArt or pictures, click the image, and then use the tools displayed on the tab that appears (SmartArt Tools or Picture Tools). If you want to see how your changes look in the presentation, switch back to Reading view. On the View tab, click Reading View. Or, click Slide Show to preview the slide show that includes transitions and animations. 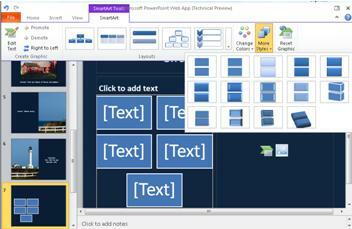 PowerPoint Web App saves your presentation automatically while you work on it. You don’t have to save your changes. If you make changes that you don't want to keep, use the Undo command or press CTRL+Z (Windows) or ⌘+Z (Mac). Editing in PowerPoint Web App is best suited for quick changes, such as making a correction, adding a graphic, or adding some slides. If you want the full set of PowerPoint capabilities, click the File tab, and then click Open in PowerPoint. 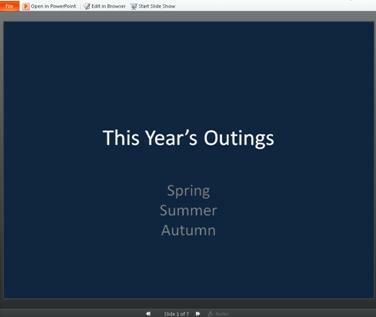 PowerPoint Web App opens the presentation directly in your PowerPoint desktop application, where you can work more substantially — for example, if you want to change transitions or edit slide content that is not in placeholders. In PowerPoint, when you click Save, PowerPoint saves the presentation back on the web server. Note: Opening presentations directly from the browser into the PowerPoint desktop application is supported in Firefox, Internet Explorer (Windows), and Safari (Mac) browsers. In Windows, you must also be using PowerPoint 2003 or later to use this feature (If you are using Firefox, you must also be using PowerPoint 2010). On the Mac, this feature requires Microsoft PowerPoint for Mac 2008 version 12.2.9 or PowerPoint for Mac 2011.